The video of our September performance of Thrown for a Loop is now available on Vimeo! Thanks again to Alex Miller, without whom this piece would not exist. And thanks also to Doug Hofstadter, whose work has inspired so many people! 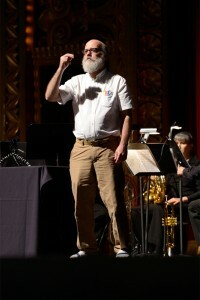 I’ll also take this opportunity to post a few of the fantastic photos that Mike Bridge took of the performance. It was a great experience, all around, and we’d like to perform the piece again, so anyone with suggestions for venues please feel free to drop me an email! Performing Thrown for a Loop at Strange Loop 2013 was a blast, and on behalf of the entire cast, I’d like to thank people for so many positive reactions and interesting conversations after the show. Since there was no printed program, I thought I’d use this post to provide cast credits and production acknowledgements. The script was written by David and Mike Stutz, the music for brass quintet and electronics composed/arranged by David Stutz (standing on the shoulders of JS Bach, Herb Alpert, and others), and choreography created by Katrina Amerine. The music was performed masterfully by St. Louis’ very own Gateway Brass Quintet. 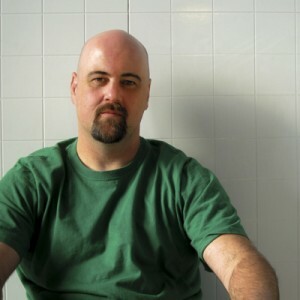 Mike Stutz has been the Artistic Director of Hoffenrich Productions for the last 20 years. 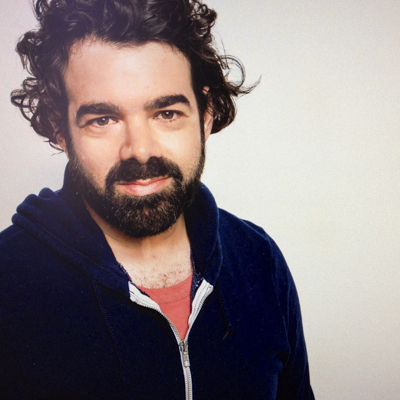 Mike has written, directed and performed in, around or near the theater, dance, performance art, television and film for a whole lotta shows. You may have heard of a few, you probably haven’t heard of most, but that’s okay. He’s had a really good time doing it. Highlights include singing at Carnegie Hall, dancing in many of the grand theaters of Europe and directing a television series based at the Friars Club of Beverly Hills that co-starred both Phyllis Diller and rapper Lil’ Bow Wow. Yeah, it was weird. 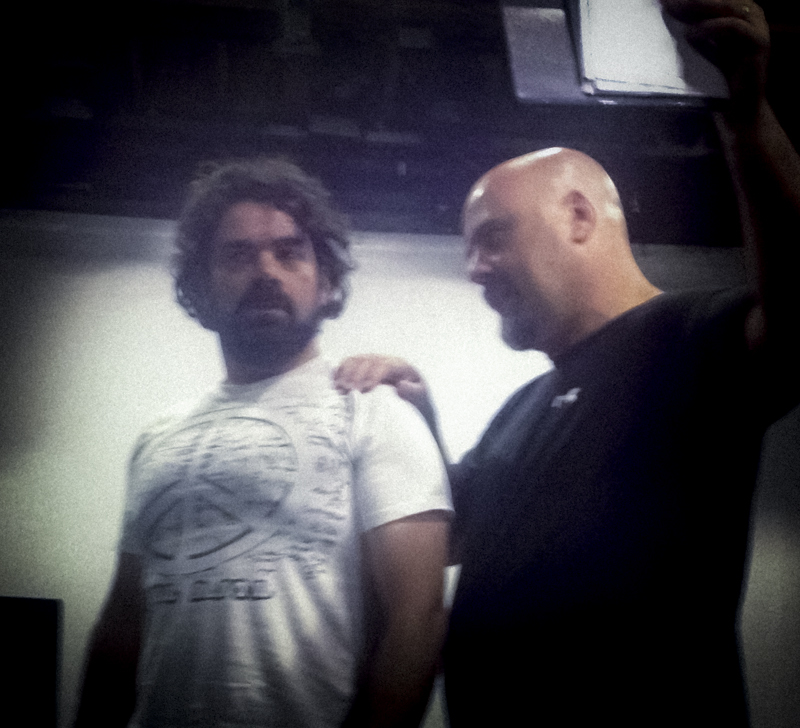 He is thrilled to partner up with his very talented and much much older brother David on Thrown For A Loop. 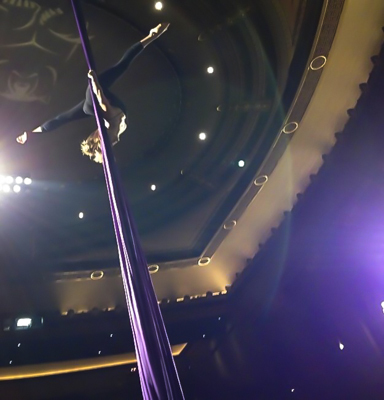 Katrina Amerine is a talented aerialist who also performs ballet and modern dance on a regular basis. She appears frequently with Aspen Santa Fe Ballet and Nancy Evans Dance Theater. Thanks to Alex Miller for approaching me with the original idea for this show, and then stepping back to be supportive while we created something totally experimental. This was a rare opportunity! Cathy King was our assistant director and fixer – thanks for everything, Cathy! Thanks also to Rachel Bowman for coaching and additional choreography, to Byron Au Yong for reading early drafts of the script and providing valuable insights, and to Felix Gerzel, Jack Romaker, and David Krueger for their vocal talents. As a bonus, there were five video cameras rolling during the performance, and so I imagine that after we get edits done, we should have a good record of the performance! Stay tuned for details on that. My brother Mike and I, along with the talented Rob Adler, had a very successful three days of workshopping the new script in Venice Beach at the Electric Lodge. We were working out kinks in the dialog, developing characters, and creating a gesture vocabulary for a show that is beginning to feel like experimental theater crossed with commedia, spiced up with brass music and dance throughout, that is focused on Douglas Hofstadter’s epistemological leanings. It is funny and profound at the same time! My very creative colleagues are bringing a whole lot of new ideas and perspective to the table, and I am looking forward to finishing the musical cues and video and starting rehearsals soon! I have been collaborating with my brother Mike on a new performance piece, which will be performed for the first time in September at Alex Miller’s Strange Loop conference in St. Louis. The piece is based on the work of Douglas Hofstadter, and is a romp through some of the concepts presented in his classic “Gödel, Escher, Bach”. Here is a link to the event page. It should be a lot of fun! A floating goddess spawning strange loops. A rowdy inquisitor speaking in antic paradox. A carnival hawker preaching the magical powers of abstraction. A sentient computer pushed to its logical limits. Drawing upon opera, circus, theater, and dance, this troupe, accompanied by brass band, video, and synthesized electronics, stumbles into the nature of mind, slides past the edge of science, and falls into the abyss of consciousness. Based on the work of eminent philosopher, author, and cognitive scientist Douglas Hofstadter, this multimedia performance explores the origins and nature of consciousness. All of the mind is a stage and we are merely players! Our June 22nd performance and installation was a success, and audience reactions were very gratifying. I will edit video excerpts and post at some point, but in the meantime, besides posting a few photos of the event, I want to credit members of the cast and those who provided artistic input. Thank you all. This piece could never have happened without you! 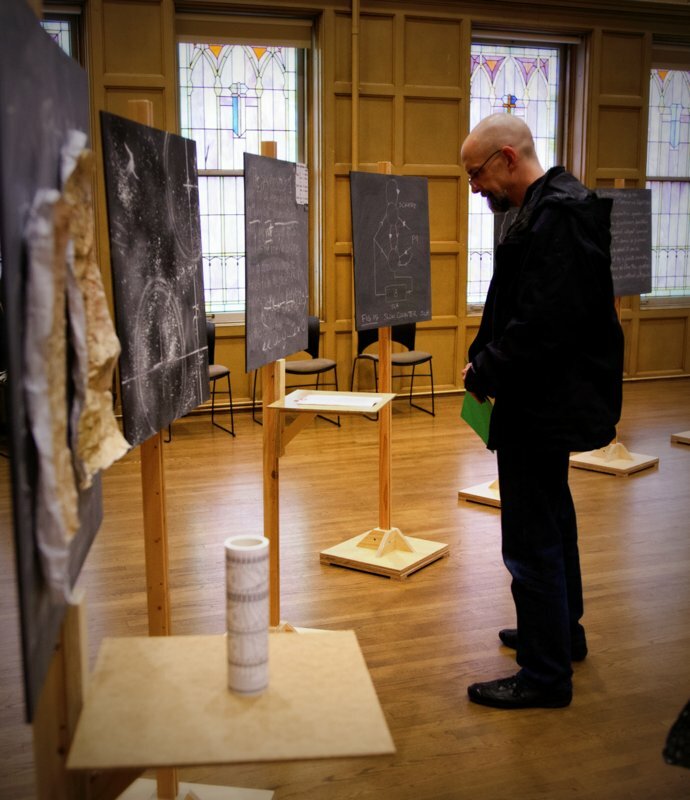 Fiber artist Geoff Shilling, who was weaving the state machine in the room at the event, also wove the large portrait of Turing and built the chalkboards that made up the set. 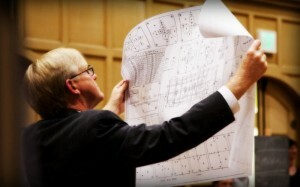 This job was immense, and he did it in less than 3 months, without complaint. Perri Lynch, who helped run the house at the event, provided 8 beautiful chalkboards based on details of the zeta calculator blueprint and also gave me valuable basic crash course in chalkboard marking techniques. Jim Bennett played the Prof perfectly, gave much input on the piece along the way, and then, to top it off, humped the set in and out of the building along with Geoff, David, and myself. Finally, thanks to John Forsen for his videography talents, Audrey Guidi for her photographic ones, and to Steve Peters and the Wayward Music Series for providing such a perfect venue for this piece. The set, when broken down, fits on two shipping pallets. Where should we perform this piece next? Bletchley Park, do you copy? One of the defining characteristics of Alan Turing was his pairing of supremely abstract thinking with a very real-world interest in the nuts and bolts of machines. He enjoyed hands-on physics, chemistry, and biology experiments his entire life, and had already begun his life-long adventures with computing machines with analog devices when he recognized and formalized the design advantages of digital technology. It is entirely natural to think of Turing’s deepest emotional relationship as being the one which he had with The Machine. He formalized what we mean by a “binary computing machine”, as well as the universal nature of such a machine. He knew that machines had the capacity to possess their own intelligence (and their own set of fallibilities) far before that was fashionable, and spoke of them in that light from day one. (He probably went further, thinking of all life as mechanical, but this is only implied in his writings.) 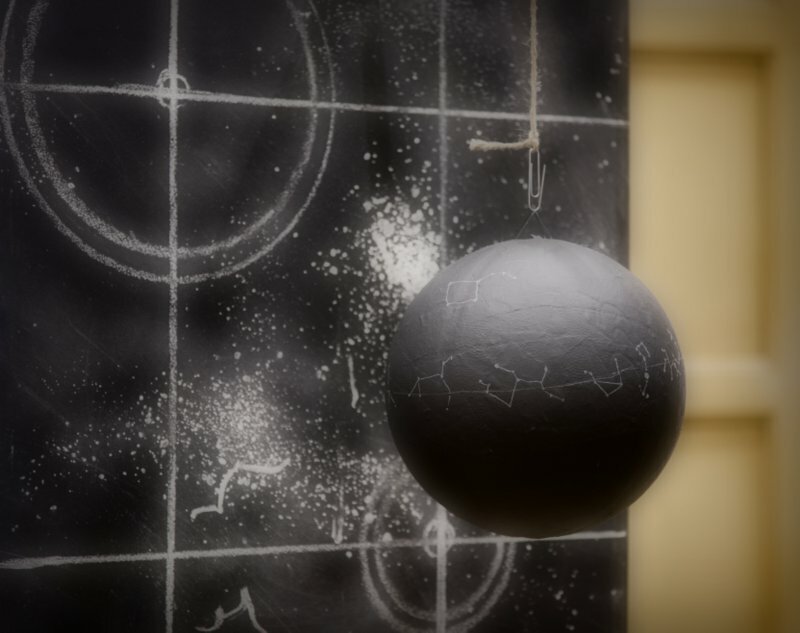 He would often solve new problems by sketching or prototyping: his output started with devices such as his childhood Foucault pendulum, continued with advanced devices of his own design including a gear-driven analog calculator, a binary electronic adder, and an electronic voice scrambler, and culminated with the first flush of true general-purpose computers in the 1940s and early 1950s, for which he was a central influence. In this installation, I have chosen one of the oldest and most universal technologies, the loom, to stand in as the ritual presence of The Machine. When I first encountered the machines described by Turing in On Computable Numbers, my mind immediately went to the motion of a shuttle, whose oscillatory movements resemble the movement of the turing machine head across its tape. The tape itself also seems symbolically linked: the fabric being created from warp and weft seems similar to the output being created from “state” and “mark”. 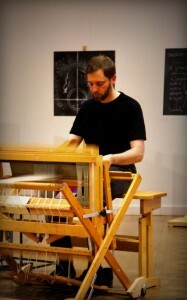 Because of this, I have chosen to weave the sounds and outputs of looms into the performance. They come and go, and are produced by both live weaving in the room, as well as by the triggering of electronic field recordings. 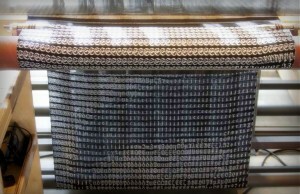 Geoff Shilling has also created a woven portrait of Turing which will sit with us in the room, invoking his presence. If you examine the portrait closely, you will see that it is composed of letters (symbols) from the Fraktur family of fonts, which is the same font that Turing used to represent the workings of his universal machines on paper. It is a beautiful piece, and a beautiful tribute. 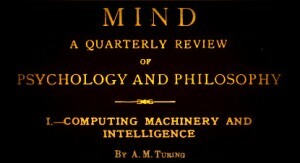 Alan Turing is among the handful of thinkers who formulated the concept of algorithmic computation. 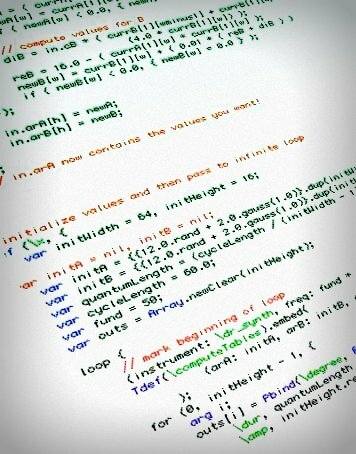 Every task that we perform with a computer begins with an algorithm, and yet this concept, which we now take for granted, was not yet formalized in the 1930s. This simple, yet immensely impactful, contribution is why I’ve chosen to create an algorithmic soundscape as the backdrop for our upcoming installation/performance. 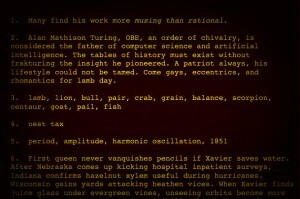 I like to think of Turing, along with Alonzo Church, as the modern muses who inspire all algorithmic arts and sciences. 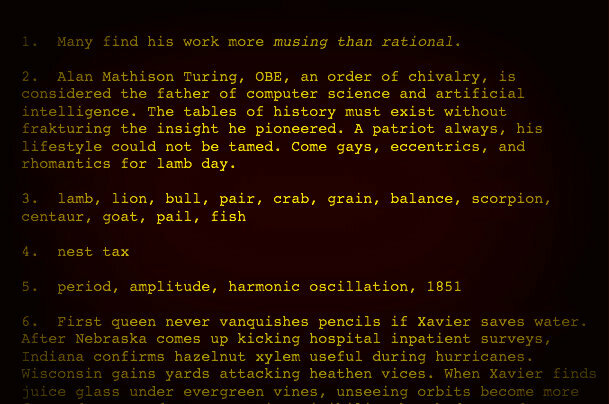 In honor of the centenary of Turing’s birth, I am creating an elegy for him. 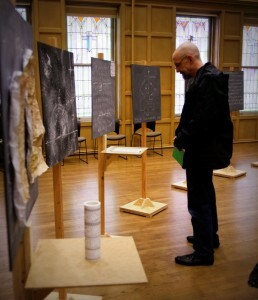 There are several parts to this Turing elegy: a physical installation (which also functions as the setting for performances), a continuous ambient soundscape which surrounds the visitor upon entering the room, and finally, a brief ritualized performance in which Turing-inspired works will be presented using sound, spoken word, and movement. I’ve been working on both the physical set and the sonic ambience lately, and thought that I’d post a little bit about the methods that I’m using to create the soundscape. There are three basic layers to this soundscape: live sounds produced by human performers, synthesized electronic sounds, and the sounds of machines (both live and via field recordings). All of the sounds relate to Turing’s life and his work, and many of them are based on either pure mathematics or realized Turing machines. All are created and/or performed using algorithms. In order to preserve the freshness of the live experience, I am not going to go into too much blog detail before the actual performance, but I will say that the live sounds will include humans operating simple machines, thinking, engaging in academic dialog, and chanting introspectively. 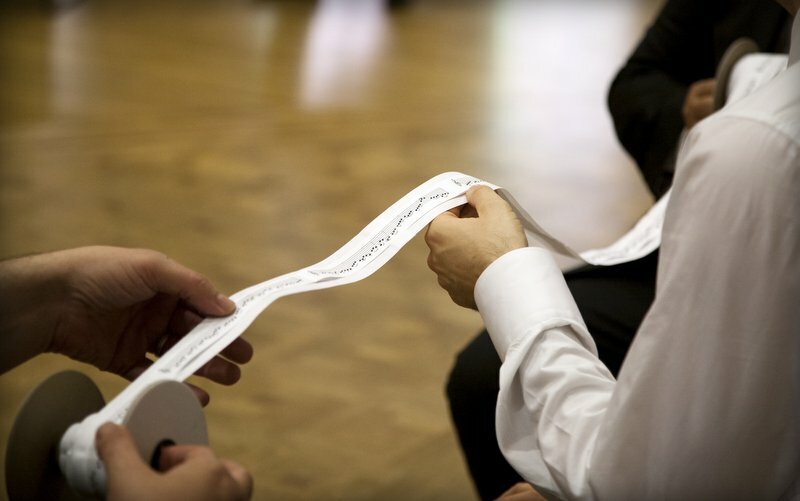 Field recordings include turing machines, looms, and machines of Turing’s own creation. The electronic portion of the soundscape is composed of algorithmically produced sonifications of Turing’s scientific output. 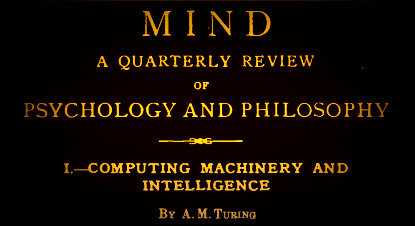 Turing’s work included not only his very significant work on computability, but also forays into disparate subjects including group theory, logic, number theory, and mathematical modeling. I am currently in the process of transforming several specific results — his work on the Riemann hypothesis, his biological model for morphogenesis, and some of the examples from the Entscheidungsproblem paper — into electronic sounds using the Supercollider programming language for digital synthesis. This weekend in Seattle, five rapping singers, along with a violin, a cello, and a percussionist, live inside of the head of a Chinese immigrant who is trapped in a stuck elevator for 81 hours. Aaron Jafferis and Byron Au Young are collaborating with director Chay Yew on an edgy new show that will premier next spring at ACT in San Francisco. They call it hiphop opera, which is pretty accurate — it is sung drama that includes ensemble rapping as well as a large dose of musical theatre, sung in a combination of English, Mandarin, and Spanish — but the marketing moniker doesn’t capture the dramatic potential in the script. The show has the kind of genre-crossing creativity, humor, and just general cleverness that presenters need these days in order to engage audiences with pathologically short attention spans. Excerpts from the work-in-progress show were performed on Friday at the Wing Luke Museum. Meanwhile still, at the Northwest Puppet Theater, the puppeteers are mounting their annual puppet opera. This year, the puppets are collaborating with their human vocal partners and and a band led by Margriet Tindemans to perform Il Girello, an obscure Baroque comic opera that is much improved by the interjection of huge quantities of bathos and improv comedy. 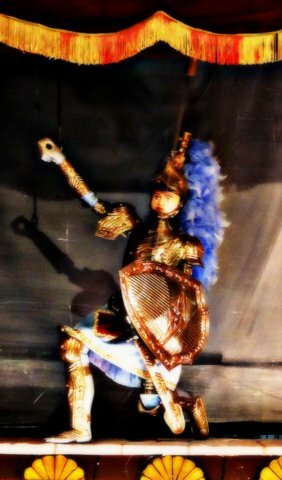 Puppet opera is yet another genre-breaking form of theater, in which dramatic flow and character development come from puppet/singer combinations, and in which great musical performances, spoken word, and silly sound effects combine side by side to achieve a surprisingly integrated theater experience. All three of these performances stretch actors and dancers to portray multiple dramatic roles simultaneously. By using abstract theatrical presentation realized as rap, dance, and puppetry, they amplify and focus the human traits that are featured in the stories they tell. They are interesting, experimental, and, I hope, a good indicator as to where theater is headed. Both Petrushka and Il Girello are still playing in Seattle. Check them out – I particularly recommend seeing them back-to-back! And go to see Stuck Elevator when it premiers in San Francisco at ACT next year. It will be worth the trip. 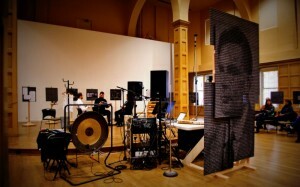 The Turing installation will go live at 7PM on Friday, 22 June, 2012 and the short concert will begin around 8PM. There is a dedicated page on this blog where you can get many more details on the event. I am using that page to track collaboration progress and to post some of the interesting material that I am working with. 2012 has been designated as the Alan Turing Year, and it is certainly appropriate to remember Turing, both for his tremendous mind and the tragic demise that was visited upon him. His work has had significant impact in diverse fields, including cryptology, pure mathematics, computing, biology, and philosophy. In this concert we will try to touch on all of these, presenting pieces inspired by both his life and his suicide. It should come as no surprise that his groundbreaking ideas are as interesting and relevant now as they ever were.